Of all amphibians, the common toad is perhaps the best known inhabitant of the SonianForest. With its huge head, bulging eyes and pockmarked skin, the creature undoubtedly stays in your mind a long time. The common toad appreciates more than any other creature the humid climate and the abundance of dead wood in some places in the SonianForest. But in the water too, these toads feel fit as a fiddle: each year, between March and April they all gather together at the various ponds of the SonianForest. They search out a suitable partner with whom to procreate. The female toads lay up to 6000 eggs in strands. Such a strand can easily be 2-4 metres long. Common toads come alive particularly at night. During daytime, they prefer to hide in self-dug holes or under stones and wood stumps. Also when winter makes its appearance, the toad seeks out a warm hole. Then it closes its eyes and goes into hibernation.. The animal remains for months in a dormant state in which it does not eat or move. From March, when the weather is more pleasant, the toad crawls out and reappears. 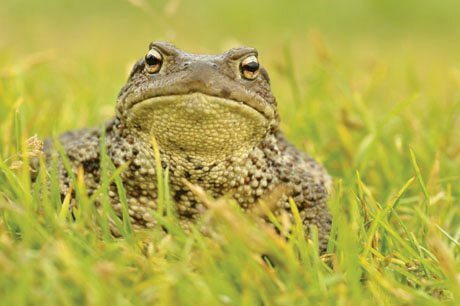 The toad is an omnivore and takes just about everything that fits in its mouth. On the menu are mainly small invertebrates such as insects, spiders, slugs and earthworms. Just like the common toad, this amphibian also really has it his way in the shady and water-rich SonianForest. 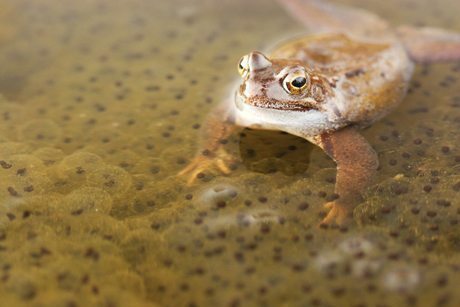 In the months of February, March and April, the brown frogs dive into the ponds to fertilise eggs and to spawn. This can best be compared with a large clump of slime containing innumerable dark brown dots, the eggs. A single female frog can deposit up to 4,000 eggs. Although the name suggests otherwise, the colour of this frog differs from individual to individual: greenish or reddish ‘brown’ frogs are in no way exceptional. However, they all have a typical dark brown spot behind their eyes. The skin of the brown frog is smooth and slimy, and unlike the common toad, it moves by jumping. On a hot summer’s day, that will be mainly in the direction of water. It then sits on the bank of a pond, quickly plunging into the water at any sign of danger. The brown frog is also able to make do extremely well in peat meadows, swamps and floodplain forests. And keen observers will be able to discern it in arable lands, gardens and even in the middle of city parks. With their unspotted, bright orange belly and a golden iris, alpine newts are undoubtedly one of the most striking and beautiful amphibians of the SonianForest. 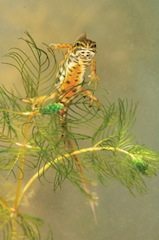 Of all salamanders, they are the most bound to water: in marshes, ponds and streams, they feel right at home. From early March to late June you will find this little animal in the different ponds of the forest to mate there. The males search for a female and try to flirt with her by swimming around her. Fertilisation takes place externally. The eggs are deposited by the female one by one onto aquatic plants. Even after mating, the salamander still remains in the close vicinity of pools and ponds, thereby sometimes making a real racket. They carry on in the ponds like real gluttons, biting into anything that moves. The little brother of the alpine newt has a brown top with dark brown spots. 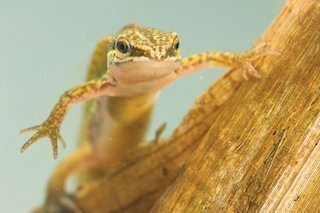 The smooth newt feels at home in sunny, stagnant water with a sludgy bottom. It hangs about mainly in parks and gardens. Because it prefers sunnier places, you will find it less often in the SonianForest than the alpine newt. 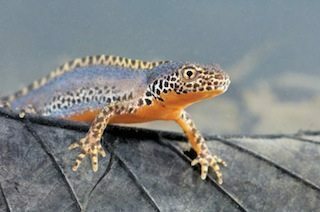 The palmate newt has a mottled brown back and a yellow stripe on its belly. It hides under stumps, stones, dead leaves and sometimes in cellars of fresh, damp houses. With some luck you’ll see it at night in the water, by the light of a torch. It dwells preferably in puddles, ruts, ponds and springs on the edge of forests, such as in the humid zones of the SonianForest. 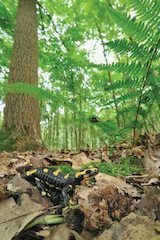 Fire salamanders can be recognised by their shiny black colour with bright yellow spots. The fire salamander is a true woodland species. It lives in shady and humid woods and forests with a lot of dead wood, mainly beech and oak forests. In the SonianForest, it is present in the VuilbeekValley in Uccle and in Watermael-Boitsfort. The great crested newt is a large, dark salamander with a rough skin and white speckled flanks. It lives in areas with hedges, hedgerows, rows of pollarded trees, reed borders and damp thickets. 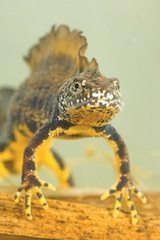 The great crested newt procreates in sunny and permanent pools, ponds and ditches. In the Sonian Forest it was spotted in the Kleine Flossendelle in Tervuren. But because it especially loves sunny spots, it doesn’t always find things to its liking in the SonianForest. Fortunately, this vulnerable species is protected by the European Habitats Directive.